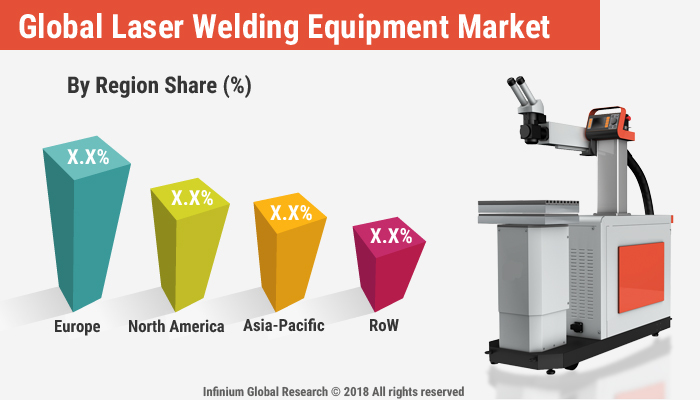 A recent report published by Infinium Global Research on laser welding equipment market provides an in-depth analysis of segments and sub-segments in the global as well as regional laser welding equipment market. The study also highlights the impact of drivers, restraints and macro indicators on the global and regional laser welding equipment market over the short term as well as long term. The report is a comprehensive presentation of trends, forecast and dollar values of the global laser welding equipment market. According to the report the global laser welding equipment market is projected to grow at a healthy CAGR over the forecast period of 2018-2024. Laser welding is a welding process used for joining multiple pieces of different material together through the laser. Not only do Lasers create strong and reliable welds, but through low cost and excellent levels of versatility, they also help to increase the efficiency of the manufacturing process. Lasers produce less distortion, with their smaller heat-affected zone around the weld. Laser welding equipment is used to make effective and contactless high-quality joints. Laser welding equipment has high power capacity lasers that weld materials such as plastic, jewelry, even building components, and hard metal. Laser welding system provides cost-effective precise production required for the industrial application. Laser welding is used as various types of systems such as mobile welding, enclosed welding, open laser welding, and alpha laser. Laser welding application vastly used in exotic applications such as laser engraving, where no other welding method is suitable. Nowadays, laser welding is a well-developed part of the metalworking industry which routinely producing welds for common items like fuel injector nozzles, medical tools battery, pacemaker cans, and aircraft engines. Growing demand for laser welding equipment in automotive and medical sector drives the growth of laser welding equipment market. Additionally, laser-welding equipment is also used in various industries such as electronics, jewelry, and machine tool. Moreover, the features offered by mobile welding equipment such as mobility and the flexible handheld system are also escalating the growth of the market. However, substitutes available for laser welding equipment such as CNC machines and water jet cutting machines are expected to hamper the growth of laser welding equipment market. Going further, continuous development in the manufacturing process and technological advancement in laser welding equipment is estimated to create growth opportunities for the laser welding equipment market during the forecast period. On the basis of region, Europe is expected to have the largest region in the laser welding equipment market. The increasing developments in laser-welding technology, the new trends in automation and increasing government funding are the major factors responsible for the growth of the market in this region. The Asia Pacific is projected to have the fastest growing region owing to the increasing the automotive and construction sector and rising awareness regarding laser-welding technology. The report on global laser welding equipment market covers segments such as technology, level of automation and end user. On the basis of technology the global laser welding equipment market is categorized into arc welding, resistance welding, oxy-fuel, laser -beam welding and others. On the basis of level of automation the global laser welding equipment market is categorized into manual, semi-automatic and automatic. On the basis of end, user the global laser welding equipment market is categorized into the automotive industry, medical device technology, electronics industry, jewelry industry, and machine tool industry. The countries covered in the North America region include the U.S., Canada, and Mexico; while Asia-Pacific includes China, Japan, India, South Korea, Malaysia, and among others. Moreover, Germany, U.K., France, Spain, and Rest of Europe are included in the European region. The U.S. drives the growth in the North America region as it is the largest market in the region. The Asia-pacific region offers substantial potential for the market growth owing to rapid growth in markets such as India and China. The APAC region is projected to experience growth at a CAGR of x.x% over the period of 2016 -2024. The report provides profiles of the companies in the global laser welding equipment market such as Emerson Electric Company, IPG Photonics, Amada Miyachi Co., Ltd, Golden Laser, Lasertechnologie, GSI Group, Inc., TRUMPF Group, LaserStar Technologies Corporation, FANUC Robotics, and JENOPTIK AG. The report provides deep insights into demand forecasts, market trends, and micro and macro indicators. In addition, this report provides insights into the factors that are driving and restraining the global laser welding equipment market. Moreover, IGR-Growth Matrix analysis given in the report brings an insight into the investment areas that existing or new market players can consider. The report provides insights into the market using analytical tools such as Porter's five forces analysis and DRO analysis of laser welding equipment market. Moreover, the study highlights current market trends and provides forecast from 2018-2024. We also have highlighted future trends in the laser welding equipment market that will impact the demand during the forecast period. Moreover, the competitive analysis given in each regional market brings an insight into the market share of the leading players. This report will help manufacturers, suppliers, and distributors of the laser welding equipment market to understand the present and future trends in this market and formulate their strategies accordingly.